A couple of weeks ago I made my spicy pulled pork for my pulled pork tacos. It was a huge 10 lb pork roast and left me with plenty of extra pork for other recipes. As I said before, I use this pulled pork for everything and I think you are going to be drooling like Homer Simpson by the end of this new use for the spicy pulled pork. It all started yesterday when I wanted to make a little party snack for the USA v. Portugal World Cup match (no I don’t want to talk about that last second goal by Portugal). I wanted to make something with the left over pulled pork that I had in my freezer. I started thinking about what all I had in the refrigerator, I had cheese, bacon, I always have an onion, and garlic, and then I remembered that I had purchased some monster-sized jalapeños peppers. 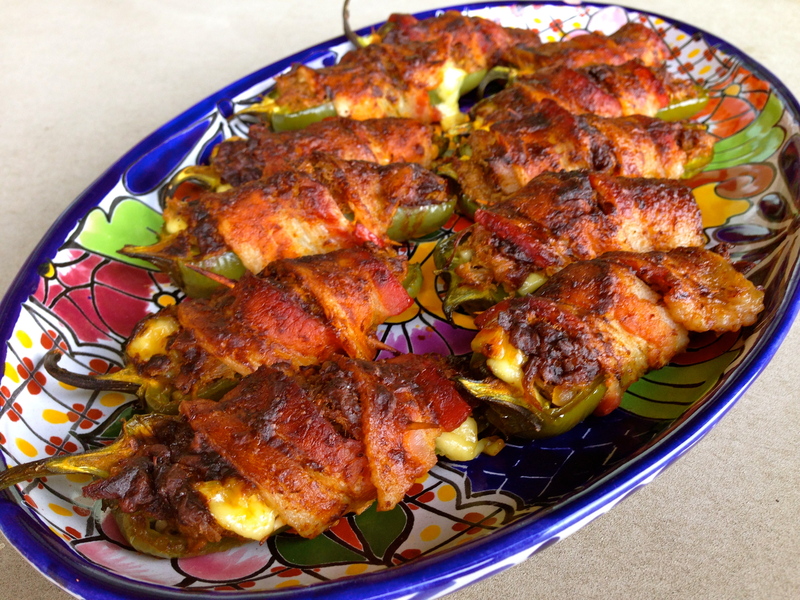 How about Pulled Pork Jalapeño Poppers…. Oh yes I’m going there!! Just picture it….. A jalapeño pepper, stuffed with cheese and spicy pulled pork, wrapped in bacon, brushed with BBQ sauce, then roasted until the bacon is crisp and the cheese oozing out…. And Cue a drooling Homer Simpson! Mmmm Do you see that first one with all the cheese oozing out? It was mine! Alright enough talk, lets just get to the recipe! In a large skillet, heat the tablespoon of Extra Virgin Olive Oil and sauté the onion until soft. Add in the minced garlic and sauté for another 2 minutes. Add the 3 cups of pulled pork and half of the BBQ Sauce. Heat until warmed through and well combined with the onion and garlic mixture. Allow to cool. Slice the jalapeños in half-length wise and scoop out all of the seeds and ribs with a spoon. The jalapeño halves should look like little boats. Stuff each of the jalapeño halves first with a spoonful of the shredded cheese and then two spoonful’s of the Spicy Pulled Pork mix. Take the 10 bacon slices and cut them in half making 20 half slices of bacon. Wrap each of the filled jalapeño halves with a piece of bacon and secure with a toothpick. Repeat until all the jalapeños are filled and wrapped with bacon. Place all of the bacon wrapped jalapeño halves cut side up on a sheet pan, making sure that they are not touching. Then with a basting brush, brush the remaining BBQ sauce on the surface of the bacon. Roast the jalapeño poppers in the oven until the bacon is crispy and the cheese starts to ooze out, About 40-45 minutes. When the bacon is crisp, take the jalapeño poppers out of the oven and transfer them to a plate lined with paper towels to cool. Serve hot or at room temperature. ** If you want a more Mexican flavor in these Jalapeño Poppers replace the BBQ sauce with Herdez Mexican Cooking Sauces. I like the Roasted Pasilla Chili and the Traditional Chipotle Sauces. I always keep a few jars of these sauces in my pantry because they are packed full of great Mexican flavor and no preservatives.